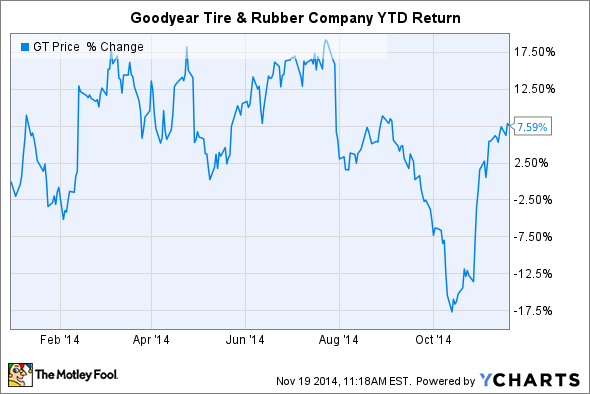 Were The Goodyear Tire & Rubber Company Earnings Really Worth a 25% Pop? It has been three weeks since Goodyear Tire & Rubber reported third-quarter earnings that resulted in a more than 25% gain. Was the pop justified? Lately, cars, planes, and heavy machinery aren't the only things rolling on tires manufactured by Goodyear Tire & Rubber (NASDAQ:GT). The company's stock has rolled higher by 25% since the announcement of third-quarter earnings at the end of October -- a spike justified by record operating income for any quarter in the company's 116-year history and the highest segment operating margin in more than 10 years (the company uses segment operating margin to describe profits from the sale of tire products). Now that investors have had nearly two weeks to digest that abrupt rebound from the stock's 60-week low, is there anything to suggest the great quarter wasn't worth such a sudden turnaround in share price? *The company's 3Q14 Adjusted EPS are $0.87. Source: Earnings press release. Goodyear had a great quarter, although given the dismal situation surrounding Goodyear's pension obligations and inefficient operations that weighed on shares since the turn of the century, investors are more focused on how quickly new management can climb back to a healthy balance sheet and strong cash flow. So far, so good, but what were the driving forces? And how well is management executing its game plan to return value to shareholders in the coming years? For a company as globally distributed as Goodyear Tire & Rubber, investors should zoom in to each reporting region to get a sense of progress and performance. For instance, North America and Europe easily represent more tire sales than Latin America and Asia, but growth in the latter markets represents an intriguing opportunity for investors and operating margins. As we'll see below, operating efficiency is the driving force behind the company's upward trajectory. Consider the number of units sold per geographic area in the first nine months of this year and how it compares to the same period in 2013. As you can see, while North America and Europe account for the bulk of the company's unit sales, Latin America and the Asia-Pacific offer great growth avenues, although the competition is greater. Now consider each region's segment operating margin for the first nine months of this year and how it compares to the same period in 2013. The focus on improving operating efficiency has clearly paid off for the mass-volume markets in North America and Europe. And don't be discouraged by falling margins in Goodyear's growth markets. The Asia-Pacific is still churning out healthy profits in spite of lower selling prices. Meanwhile, Latin America unit sales are suffering this year due to uncertainties in Venezuela, while operating margin is down mostly due to expansion in Brazil (an investment in the long term). Premium products have also provided a boost for the company. When when it comes to tires, it's more complicated than just using better materials. Premium tires are manufactured quite differently than lower-value tires -- something Goodyear can exploit with its unique capabilities and expertise and use as leverage against competitors. Additionally, the company is taking advantage of the momentum to repurchase up to $150 million of shares in the fourth quarter alone. That represents one-third of the total shares in the current three-year repurchasing program ending in 2016. All else being equal, fewer shares mean higher earnings per share and stock price, but I would rather see capital deployed in high-value investments. Goodyear Tire & Rubber's third-quarter earnings demonstrated how a large, distributed, and knowledgeable company can leverage its expertise to exploit current market conditions and compete with smaller, sometimes state-owned manufacturers rather than be too big to respond. Investors were pleased that management updated its full-year earnings guidance to weigh in at the high end of the previously reported range of 10% to 15%. That not only shows that the company is executing on its growth plans, but that the previously reported goal of growing earnings by at least 10% through 2016 might not be as unattainable as once thought by Wall Street. In other words, the company's more than 25% gain since October lows was certainly justified by recent performance and the optimism for continued momentum.